Friday was a pretty amazing day. The day started off pretty amazing, and then I made my way down to Glenwood. Friday was my dad and step-mom's 20 year wedding anniversary, and we were making a spectacle of it. Back on May 9th, 1994, my parents went to the courthouse and quietly got married. No hoopla. No ceremony. So we decided to give them a ceremony, although they were very serious about this not being a huge deal and it only being family there. 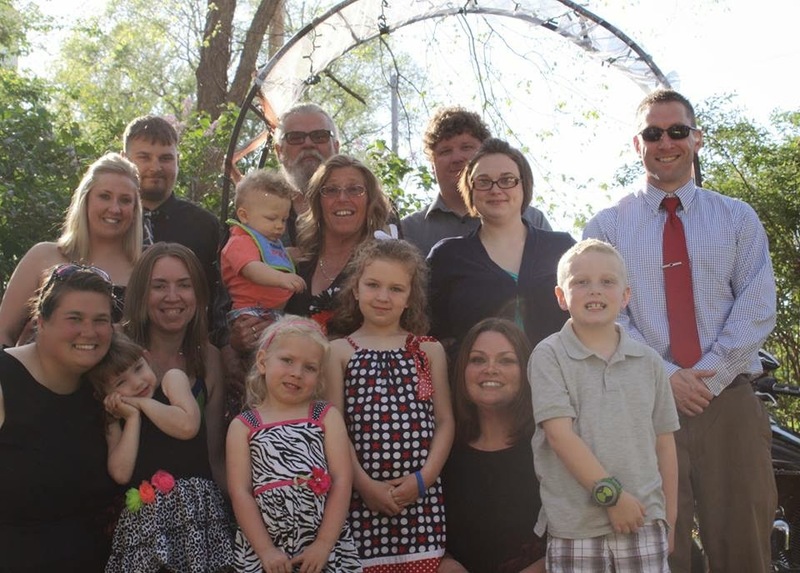 Of course, when your immediate family looks like this, that's still quite a few people. We had a great day. We spent the afternoon hanging out and preparing for the ceremony, then we all got dressed up and headed into the backyard. The ceremony was beautiful, and not because I wrote it, but because of the obvious emotion and love my parents have for each other. I mean, my dad cried. Will he be mad I called him out on my blog? Maybe. But it was wonderful, and I hope to someday find a relationship where a guy will cry just because he loves me that much. After the vows were said and the rings were exchanged, we partied for HOURS. A lot of food was consumed, a LOT of shots were taken. A fire was made. One person fell into the fire. One person passed out before 9p. It was a great night.